When Rebecca Namayanja first started fishing at Kasyeni Landing, on Lake Victoria, it wasn’t the physical challenge of hauling in the nets that proved difficult; it was the policemen who repeatedly confiscated her nets. The men claimed they were substandard and were being used to catch young fish. “I soon realised this was a silent game intended to push me out of business,” she says. They weren’t the only ones trying to put her off. The other fishermen frowned at her. Far from being cowed, she went on to expand her business. Early this year, Namayanja used the money she had earned from selling the fish to buy five more boats and 25 fishing nets, plus a refrigerator to preserve the fish. She has been able to employ about 10 men to help her with offloading, cleaning and transporting the fish to her suppliers. “Nothing makes me happy like the feel of employing men,” Namayanja boasts, smiling broadly. She is one of a small handful of fisherwomen who are breaking the taboos which have traditionally prevented women joining the industry. She works as hard, if not harder, than any fisherman. It’s 6am on a warm Saturday and as the sun rises over Lake Victoria Namayanja emerges from a boat holding a large fish, at least half a metre in length. With the help of one of her workers, she loads the fish from one of her six boats into plastic sacks and heads off to the Kasenyi landing market. It’s a good catch and she smiles as she prepares to begin one of the most hectic hours of the day, auctioning her fish. As soon as she reaches the market she begins counting the fish, carefully entering her figures into an exercise book. Meanwhile, hundreds of fishmongers surround her, waiting for the auction to begin. “In a good business week, I normally get three tones of fish and supply to the big fish industries in Kampala,” says Namayanja. 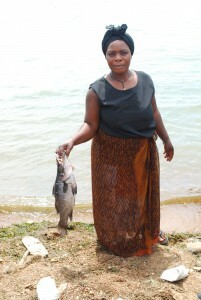 In Uganda, as in many other African countries, cultural traditions have imposed serious restrictions on women’s involvement in the fishing sector. It was a taboo for a woman to touch the fishing nets and cast the net into the water, let alone pull out fish from the nets themselves or board a boat. A woman’s work was restricted to preserving the fish, through salting and drying, in the home. “My grandmother once told me that it was taboo for a menstruating woman to go fishing on the lake, because this was an insult to the gods of the seas,” she says, adding she now realises this was just superstition. Namayanja has defied the odds and stereotypes. Armed with nothing but her strong desire for success, she bought her first boat from the savings she had made from her hotel business, which she ran at Kasenyi Landing site. 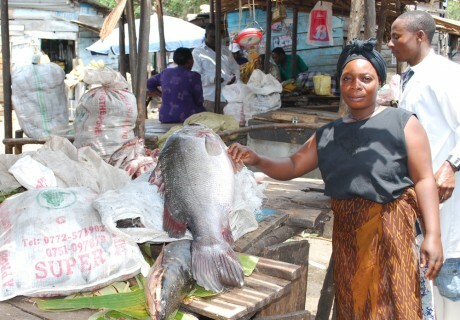 A single mother of two girls, aged five and six, Namayanja says the desire to make money and provide the best care for her children inspired her to expand into the fishing industry. However, fisherwomen face the same challenges as fishermen. First is the cost of equipment. She paid almost 5 million shillings (£1,300 or 1,530 euros) for 25 fishing nets and the engines for her boats. Second is pirates. The number of pirates on Lake Victoria has increased dramatically and Namayanja fears they will steal her engines. “I find it hard to doze off when my boats are out on the waters, especially in the night,” she says. While fishing has spelt success for her, Namayanja says that she doesn’t want her children to pursue the same line of thought. She wants her children, to think higher, perhaps compete with the men at much higher levels. “I have a job. I have gained confidence and control over my own affairs,” she says proudly. She already has a plot of land in her name, and wants to build a better home for her children. In 2003, Uganda’s parliament passed laws ensuring equal pay for men and women for work of equal value and promoting equal employment opportunities for women. But discrimination against women remains rife, aggravated by deeply rooted patriarchal traditions. Namayanja thinks gender equality is still far from reality. Research conducted by the population secretariat also found out that gender disadvantages that appear among Uganda women are sewn in early childhood. The study shows that men and women have different access to education, economic opportunities, health, personal security and leisure time. In Uganda 45 per cent of females aged ten and above are literate compared to 68 per cent of males. This is a result of low enrollment in school, high drop-out rates. “Many women in Uganda are still held back by inadequate resources, lack of capital, traditional and cultural norms that dictate that we must be submissive and act like women. These stereotypes will continue to quash our quest for equality,” Namayanja concludes. She believes her empowerment can only be strengthened through education and training. “I want to learn the basics of business management, so I can be able to compete in the male-dominated business world,” she says.